Denver + Arapahoe, CO – June 14, 2017 – Delwest, a leading multifamily and single family developer who specializes in affordable housing and distressed real estate investment in Colorado announces the start of construction at Highline Pointe. This luxury apartment project is located off of the historic Highline Canal and straddles the border of Denver and Arapahoe Counties. Located at Parker Road and Ulster Street, Highline Pointe will offer this part of town a luxury apartment option. Apartment features will include high end finishes, resort style amenities, direct access to the Highline Canal and easy access to Glendale, Cherry Creek and Downtown Denver. The development will also feature structured parking garages, elevators and interior corridors. 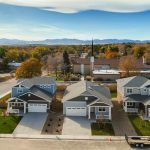 In addition, this development boasts panoramic views of the Front Range. Joe DelZotto, Principal of Delwest has a vision for a community where personal interaction with neighbors, a healthy lifestyle and a sense of “living well” is the primary focus. The project is expected to be complete late 2018. The company will celebrate ground breaking with a private ceremony in late June.